Here is an overview of the laws that protect consumers in used car sales. New Jersey and New York have used car lemon laws, but they have certain limitations. There are mileage limitations and the New Jersey used car lemon law does not provide for attorneys fee to the plaintiff. While the New Jersey new car lemon law provides for a mileage offset from date of first repair, the used car lemon law deduction encompasses the entire mileage. Besides the lemon law, other laws can protect the consumer. If the dealer fails to honor the warranty, the consumer may file a claim for breach of warranty. If the vehicle was misrepresented, claims for consumer fraud are possible. 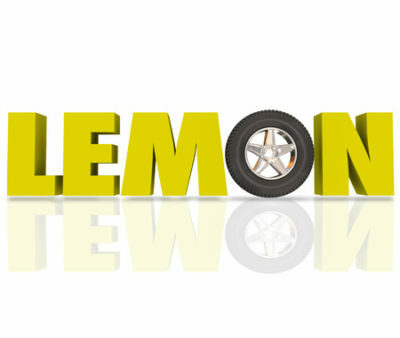 The used car lemon law allows the consumer to file in the lemon law unit or in court. Since the lemon law unit handles only lemon law claims, it is usually preferable to file a used car lemon law claims with other claims in court. Other laws such as the consumer fraud act or the Magnuson-Moss Act provide for counsel fees. We excerpt the New Jersey used car lemon law below. The New Jersey Used Car Lemon law requires certain minimum warranties and prohibits some common deceptive practices. The provisions of sections 3, 4, and 5 shall not apply to: any used motor vehicle sold for less than $3,000; any used motor vehicle over seven or more model years old; … or, any used motor vehicle with more than 100,000 miles. A consumer, as a result of a price negotiation for the purchase of a used motor vehicle with over 60,000 miles, may elect to waive the dealer’s obligation to provide a warranty on the used motor vehicle provided that it complies with NJAC 13:45A-26F.18. It is unclear whether the regulation applies to unadvertised vehicles. Cases in other states have dealt with failure to disclose body damage, though we see no New Jersey case on this issue. D. Other Prohibited Advertising Practices. 1. The use of any type, size, location, lighting, illustration, graphic depiction or color so as to obscure or make misleading any material fact. 2. The setting forth of an advertised price which has been calculated by deducting a down payment, trade-in allowance, or any deductions other than a manufacturer’s rebate…. 5. The failure to state the applicable time period of any special offer, in at least 10-point type immediately adjacent tot he special offer, unless the special offer is a manufacturer’s program. 13. The use of such terms or phrases as lowest prices, lower prices than anyone else or our lowest prices of the year or similar terms or phrases if such claim cannot be substantiated by the advertiser. Failure to place the window sticker on the vehicle is a deceptive practice and under New Jersey law as well as some other states, the consumer may sue for additional damages. The consumer may also attempt to cancel the deal. IMPORTANT: Spoken promises are difficult to enforce. Ask the dealer to put all promises in writing. Keep this form. FULL LIMITED WARANTY. The dealer will pay ____% of the labor and ____% of the parts for the coveredsystems that fail during the warranty period. Ask the dealer for a copy of the warranty document for a full explanation of warranty coverage, exclusions, and the dealer’s repair obligations. Under statelaw, “implied warranties” may give you even more rights. SERVICE CONTRACT. A service contract is available at an extra charge on this vehicle. Ask for details as to coverage, deductible, price, and exclusions. If you buy a service contract within 90 days of the time of sale, state law “implied warranties” may give you additional rights. PRE PURCHASE INSPECTION: ASK THE DEALER IF YOU MAY HAVE THIS VEHICLE INSPECTED BY YOUR MECHANIC EITHER ON OR OFF THE LOT. 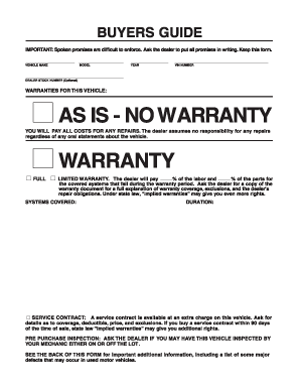 SEE THE BACK OF THIS FORM for important additional information, including a list of some major defects that may occur in used motor vehicles. Federal law requires that you state the mileage upon transfer of ownership. Failure to complete or provide a false statement may result in fines and / or imprisonment. I, __________________________________________ (transferor’s or seller’s name, Print) state that the odometer now reads ___________________ (no tenths) miles and to the best of my knowledge that it reflects the actual mileage of the vehicle described below, unless one of the following statements is checked. (1) I hereby certify that to the best of my knowledge the odometer reading reflects the amount of mileage in excess of its mechanical limits. (2) I hereby certify that the odometer reading is NOT the actual mileage. 3. If the used motor vehicle has 60,000 miles or more, the warranty shall be, at a minimum, 30 days or 1,000 miles, whichever comes first, unless the consumer elects to waive this warranty pursuant to the terms of N.J.A.C. 13:45A-26F.4.